I feel deeply humbled and grateful to receive this prestigious 2018 Harris Wofford Global Citizen Award conferred by the National Peace Corps Association. The award means much to me because the US Peace Corps has long been an organization that I have greatly admired and felt inspired by since my childhood. 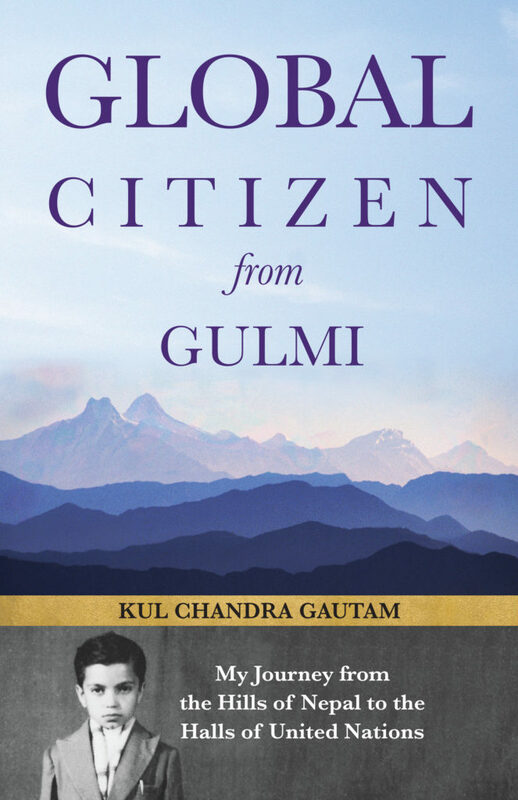 It is an amazing coincidence that I received the news of being nominated for this prize named “Global Citizen Award” just as a book of my memoirs entitled “Global Citizen from Gulmi” was going to the printer. 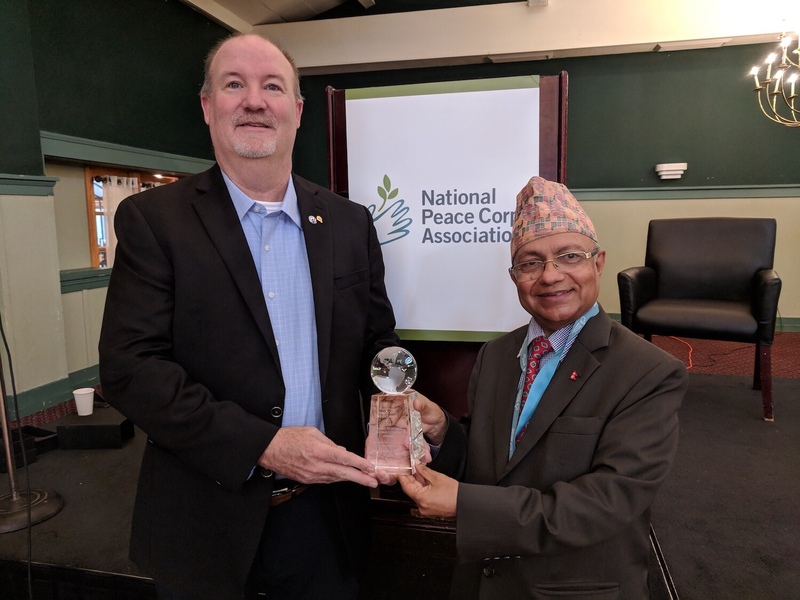 I was caught by complete surprise when I heard from a returned PCV from Nepal – with whom I had very infrequent contacts – that he was proposing my name for the Harris Wofford Award. Thank you, Doug Hall – who is here with us today – for thinking of me for this award. Doug also enlisted testimonials of support for my nomination from several other ex-Nepal PCVs – Zach Hahn, Dave O’Connor, Sue Mallick, Charles Bailey, Bill Kieffer, Alan Fairbank and the American Ambassador to Nepal Alaina Teplitz, and the former Director of the Peace Corps and my boss at UNICEF, Carol Bellamy. I thank them all for their goodwill, guidance and friendship. I recount in my memoir that my life has been full of many serendipitous happenings. Often quite unexpectedly, I have met the right people at the right time, or ended up being assigned to the right job in the right place that offered a unique and unexpected opportunity to make a meaningful contribution to worthy causes. My wife Binata – who is here with us along with our daughter Jyotsna – often reminds me that I have rarely gotten any job that I have actually applied for, or any particular assignment or honour I have actively sought or desired. I often got something better – and unexpected. This Peace Corps award, is the latest in that series, for which I am most grateful. Speaking of serendipity, I read a fascinating article in the New Republic magazine of November 2014 that characterized Senator Harris Wofford as the 20th century’s most serendipitous man. His political career was punctuated by one fortuitous event after another that led him to be associated with many worthy causes – among them the Peace Corps, AmeriCorps, the civil rights movement, US politics at the state and national level. My own progression from a remote village without a school to Dartmouth and Princeton, and then on to the UN – and now getting this “Global Citizen Award’ – all these have also been a result of a serendipity that I seem to share with Senator Wofford. I am in the last quarter – perhaps the last decade – of my life now. I have had a successful career and fulfilling life, devoted to serving humanity. I do not need or seek any more personal awards, rewards or glory now. But I do cherish a hope – a dream really – that perhaps we can turn this wonderful Harris Wofford Global Citizen Award from a personal prize to a bigger purpose – in the true spirit of the Peace Corps as originally envisioned by President John F Kennedy, and further nurtured by Sargent Shriver and Harris Wofford. I will share some thoughts on how we might do that towards the end of my remarks. Let me now share a short history of my association – I might even say my love affair – with the Peace Corps. I was born in a small village in a remote district of Nepal, with all the characteristics of primitive underdevelopment – no school, no health post, no paved roads, no post office, no telephones. Poverty was rampant and endemic in my village. 95 percent of men and 100 percent of women were illiterate. Maternal and child mortality rates were very high. My father was semi-literate and my mother was completely illiterate. I was born under-weight, and suffered many childhood illnesses. The elders in my family used to whisper that it was a miracle that I survived – and eventually thrived. Among the many coincidences that led to my becoming a global citizen instead of a village bumpkin, a key factor was my early contacts and association with the Peace Corps. It all started in 1962 when I was a 7th grade student in the town of Tansen in the mid-hills of Nepal – which in those days was 3 days walk from my village. Soon after I was enrolled in school, we heard that two American Peace Corps teachers were coming to teach English. The whole town was curious and excited, filled with anticipation. Until then, I had never met an American – or a European. I had just started learning English and could not even put together a sentence. To make a long story short, I became quite close to my Peace Corps teacher, Ken Martin, who came from just outside Springfield, Illinois. Outside school hours, I used to visit the PCVs at their residence to practice English. They also taught me how to play chess and Scrabble. To my surprise, and that of my Peace Corps teachers, I became pretty good at Scrabble. Occasionally I even beat them. Once, the Deputy American Ambassador to Nepal, Harry Barnes – who went on to become an illustrious Ambassador in several countries – came to visit the PCVs in Tansen. I was introduced to him as the little boy who beat his American teachers in Scrabble. The Deputy Ambassador was duly impressed, and asked me to look him up if I ever came to Kathmandu. And I did, and he even wrote a letter recommending me for a Fulbright travel grant when I was admitted to Dartmouth College with full scholarship right after finishing high school in Nepal. I had no problem getting an American visa, but it took me two years to get a Nepali passport. In those days getting a passport was a privilege reserved for members of the royal family or the Kathmandu elite, not for a poor village boy like me. The long story of my struggle to get a passport occupies a whole chapter in my memoir, which I hope some of you will read. But how did I get admission and full scholarship at Dartmouth – a very competitive Ivy League College? How did I even hear about it? There is another chapter about that and my Dartmouth experience and cultural shock in America in my memoir. It was a Peace Corps volunteer who helped guide me through the admission process. That volunteer and my early mentor was Zach Hahn, who will join us later this evening. But I want to thank him in advance right now. My connections with the Peace Corps continued as I later became a trainer for Nepal-bound PCVs at the University of California at Davis.Many of those volunteers became life-long friends, including Susan McBride Malick who is with us today. Thank you, Sue for your warm friendship. In Hanover, New Hampshire, helping me to grasp the peculiarities and philosophical underpinnings of American culture, was the family of another ex-Nepal PCV, David O’Connor, whose father was a Professor at Dartmouth. Like many older RPCVs here, I too was actively involved in the anti-Vietnam War protests that were sweeping across American campuses. I was the founding President of the International Students’ Association at Dartmouth, and opposition to the war was one of the causes we embraced. When Senator George McGovern visited Dartmouth in 1971, stumping for the presidency, I had the opportunity to be on a panel with him. I went on to support his candidacy – partly because I shared his ideas and ideals, and partly because his running mate was former Peace Corps Director, Sargent Shriver, whom I admired immensely. So, you can see the long Peace Corps thread that runs through my life. Joining the UN later was also directly influenced by the Peace Corps’ ideals, which the UN embodies on an even larger scale. I am aware that the winner of the Harris Wofford Global Citizen Award is expected to do some gentle, informal lobbying for the Peace Corps at the US Congress, which I will happily do next week. But unbeknownst to most of you, I first began lobbying for the Peace Corps way back in 1972, when I was a graduate student at Princeton. It is quite normal in a democracy that even worthy causes do not always enjoy universal support. The Peace Corps is no exception, nor, I might add is the United Nations. In 1972, some powerful members of Congress were hesitant and even hostile to supporting the annual budget appropriation for the Peace Corps. A fellow student and friend of mine at Princeton, who had been a PCV in Nepal, Charles Bailey, suggested that I join him in Washington DC to try and persuade one particular Congressman to support the Peace Corps budget. The Congressman concerned was Otto Passman (R-LA), a super-conservative and influential member of the House appropriations committee. He was holding up the funding with the intention of making the Peace Corps weak and eventually defunct. If you Google Passman and Peace Corps you will see a quote attributed to him in which he says, “If I had three minutes left to live, I’d kill the Peace Corps”. Passman barely gave us a hearing. Instead he gave us – in his fine Southern accent – an early version of the “America First” speech that we hear so often these days! Charles and I politely thanked him, briefly shared our personal experiences, and told him why we thought the Peace Corps was doing a great job promoting goodwill for the US and providing great help to countries like Nepal. And we pleaded for his support. The Congressman was polite but non-committal. We were not sure if we had convinced him, but we felt good that at least he heard our pitch. You can imagine how happy we were to learn, shortly thereafter, that the appropriation was approved. Charles told me later that we deserved a medal (or perhaps combat pay) for going to the lion’s den to make our pitch. Charles very much wanted to be with us today, but he could not be here as he is pursuing another worthy cause that he and I have been deeply committed to: mobilizing support to help millions of children still suffering from the residue of Agent Orange sprayed during the Vietnam War half a century ago. In lieu of combat pay or a medal for our efforts back then, I’d like to share with Charles the honour of today’s Harris Wofford Global Citizen Award! Let me add one more Peace Corps connection – at one point my boss at UNICEF was Carol Bellamy who had earlier been a PCV in Guatemala and Director of the Peace Corps in Washington DC. It was at Carol’s recommendation that Kofi Annan – a great leader of the UN who just passed away last week – appointed me as her Deputy at UNICEF and an Assistant Secretary-General of the UN. So, thank you, Carol. So, dear friends, as you can see, my journey from Nepal to Dartmouth, then on to Princeton and the United Nations would not have happened had it not been for the Peace Corps. And I know, mine is not a unique case. There are thousands of boys and girls in developing countries whose lives have been transformed by the Peace Corps. All the distinguished previous recipients of the Harris Wofford Award, including my good friend Surin Pitsuwan, former Foreign Minister of Thailand who got the Award in 2014, are testimony to the great impact of the Peace Corps around the world. Let me conclude now with some final observations and a suggestion. The United States today is the world’s sole super-power, spending over a trillion dollars a year on military might. But I strongly believe that less than half a billion dollars that it invests in the Peace Corps earns far more respect and goodwill for the US than all of its defence spending. A strong military security is, of course, necessary for a super-power in today’s troubled world. But no less important is the investment in human security and development through an organization like the Peace Corps – that touches many more ordinary people’s lives and helps build bridges of peace and friendship across the world. I recall that was precisely the vision of President John F Kennedy when he established the Peace Corps. In a world so desperately lacking such vision, the Peace Corps and all of you, RPCVs, are the inheritors and embodiments of that noble vision. So, I salute you. During their active service, most PCVs help teach English, impart vocational education, promote health and nutrition, agriculture and environment, and myriad other fields these days. But ultimately the Peace Corps’ mission is to contribute to building peace. Without peace, democracy cannot flourish and development is not sustainable. Let us remember that the Peace Corps experience is often as important for the education and enlightenment of PCVs as the help they provide to their host communities. It is a two-way street. And it is an experience that makes every RPCV a true global citizen. I have always admired the vibrancy of American democracy, and all the other great qualities of this country. On the other hand, I fear that much of middle America today suffers from what was once known as the “Middle Kingdom” syndrome of ancient China. Historians say that the rulers and people of China once felt their country was the center of the universe. The rest of the world was peripheral comprised of vassal states that paid tributes to the Chinese emperor to safeguard their autonomy. I am afraid “the America First” mentality we are seeing today reflects the Middle Kingdom syndrome. As RPCVs, you have a better, more nuanced understanding. Many of you know from first-hand experience what it was like to be seen – fairly or not – as an “Ugly American” abroad. This must not be allowed to happen again. More than any other group of Americans, I believe that the RPCVs can help build a more enlightened America as part of, not apart from, a more just, peaceful and prosperous world. So, I want to leave you with a challenge and a suggestion. There are nearly a quarter of a million RPCVs now – an impressive number of patriotic Americans who are also enlightened global citizens. Enriched by their Peace Corps experience, I know many RPCVs are involved in many worthwhile projects in their home communities, as well as helping with small projects in the countries where they served. The NPCA does a great job in encouraging and supporting such activities by RPCVs. And I want to congratulate the leadership of NPCA for that. But I believe that if we foster stronger partnership with other like-minded organizations, the RPCVs and the NPCA can have an even bigger impact. I am glad to learn that NPCA already has very productive partnerships with many like-minded organizations, such as Water Charity, Better Angels, Dining for Women, many others. That is great. We have seen how Rotary International partnering with UNICEF, WHO and the US government has led to virtually eradicating polio from the whole world – that used to cripple and kill millions of people. There are other examples of public-private partnerships leading to great impact in drastic reduction of malaria, TB, HIV/AIDS, child labour or child marriage, and in expanding basic education or women’s empowerment. If we rally behind some such broad public policy agenda, for example, ending the worst aspects of poverty here in the US and around the world, working with other like-minded organizations, the RPCVs can have huge impact on an even larger larger scale. We now have a broadly universally accepted global anti-poverty agenda called the sustainable development goals endorsed by all countries of the world, including the United States at the United Nations. It is a non-partisan agenda, so you can support it whether you are a Republican or a Democrat or neither. Besides global organizations like the UN and the World Bank, there are several non-partisan civic organizations in the US that have made ending extreme poverty and promoting shared prosperity their main agenda. I would like to recommend that the NPCA and its affiliate groups collectively – and RPCVs individually – consider joining hands with more such organizations. One such organization I am involved with is RESULTS – a fabulous group that has hundreds of grassroots volunteers in all 50 states of the US and many other countries. It has an impressive track-record of successful lobbying to secure bi-partisan support for ending poverty in America and abroad. A great leader of RESULTS, and an RPCV is Ken Patterson, who is here with us today. He can provide you more information about how RPCVs and RESULTS might partner together. Suffice it to say that I believe a partnership between NPCA and RESULTS would be a marriage made in heaven. I sincerely believe that the founding leaders of the Peace Corps – John F Kennedy, Sargent Shriver and Harris Wofford – would be very proud of such a partnership. It is in that spirit that I have asked the symbolic monetary part of my Global Citizen Award to be given to a girls’ education project supported by UNICEF in Nepal. And it is in that spirit that I would like to dedicate and share the Harris Wofford Global Citizen award with all of you, RPCVs, in our common pursuit to build a better world of peace and prosperity for all the world’s children.